Tags: charity and non profit. A project that’s sadly necessary in the modern world, a charity to help the Tamils where no non government organisation will. Ten for Tamil’s founder was very concerned about the plight of the Tamils, and Rinet IT was more than happy to help out. Non profit organisations are a favourite cause for Rinet IT. The website was built using WordPress with a child theme which is based on the included Twenty Sixteen default theme. The design is simple and appealing and the site loads fast. Some videos were loaded onto the site. They could have been put onto YouTube rather than being hosted on the Ten for Tamils server, but I didn’t want to risk unwanted ads coming up. 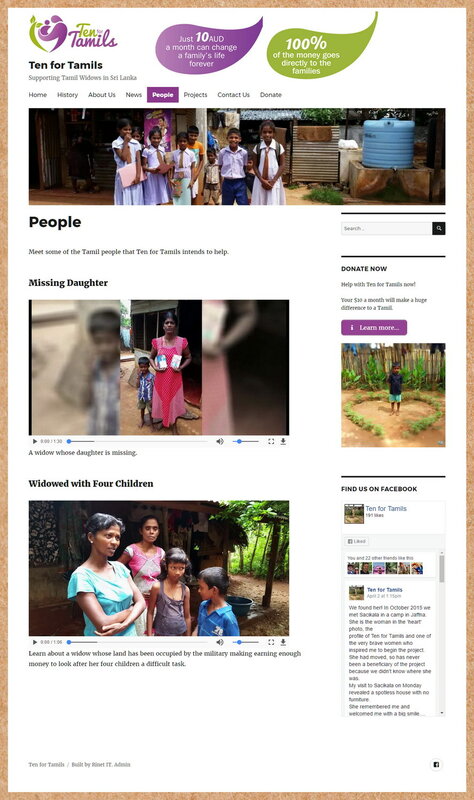 The site can be viewed at tenfortamils.org.au.